In 1938, the South African government emitted a specification for two armored car models. They were to be built locally by South African industries with various shipped parts. Marmon-Herrington (USA) presented its own design in 1939, which was accepted for production. The four-wheel drive train and transmission was its own product, but chassis elements and engine came from the Ford 3-ton lorry built in Canada, and the armament was British. All these parts converged to South Africa by ship and rail, to be assembled at the Dorman Long structural steel company, with steel armored plates from the South African Iron & Steel Industrial Corporation, and the chassis assembly by the Ford Motor Company of South Africa. The final model waslocally called the “South African Reconnaissance Car”, and was sold to the British army as the “Armoured Car Marmon-Herrington Mk. I”. The Marmon-Herrington Mark I was basically a Ford V8 truck with sloped armor, riveted hull and a fully traversable open-top turret behind the driver compartment. This turret was originally designed for a single liquid-cooled cal .303 (7.7 mm) Vickers machine gun, with a second fixed in a ball mount on the left hand side of the driving compartment. The turret was later equipped with an extra AA mount equipped with a 7.7 mm (0.3 in) Bren gun. The radiator armored hatch could be opened and the engine hood as well, giving better access to the mechanical parts. The driver could see through small side and frontal viewports, with a large frontal armored hatch which was usually set in open position. There were two large access doors at the rear. Ground clearance was around 50 cm (1.64 ft). There was initially a rear axle drive, with a six-speed (5 forward, 1 reverse) mechanical gearbox. The suspensions were of the leaf type. The armor ranged from 6 to 12 mm (0.24-0.47 in), only capable of sustaining rifle and small arms fire. The crew comprised a driver, commander, gunner with a fourth crewmember firing the second machine-gun, Bren gun and/or acting as a radio operator/navigator. The US National Guard bought several machines (perhaps 13, due to the mismatch between 100 and 113 Mk.I produced in total), equipped with one or two Browning cal.30 (7.62 mm) instead. The second type was a clear improvement, with a slightly longer wheelbase, real four-wheel drive and welding assembly. Nearly 900 were built. The initial armament was unchanged in the Union Defense Forces (Mobile Field Force model), with two Bren-guns (one turret, one in a hull left ball mount), but the British “Middle East models”, serving in North Africa, received a redesigned turret equipped with an extra Boys 14 mm (0.55 in) antitank rifle, with a coaxial Bren 7.7 mm (0.3 in). It was later equipped with additional mounts for an extra AA Bren and/or a rear AA pintle mount for a Vickers cal.303 (7.7 mm). The Mark II was more agile in the desert, but suffered from poor protection, despite an angular shape with well-balanced slopes. They also had extra fixations for spare parts, tires, extra storage or sand recovery/unbogging ramps. Many makeshift armament and modifications were added during the course of the conflict. Production comprised 338 vehicles of the British “Middle East” version and 549 of the MFF or “Mobile Field Force”. The Marmon-Herrington Mark I were uniquely used by the South African UDF (Union Defense Forces), serving during the early stage of the east African campaign against Italian colonial assets. Poor mobility on rough terrain and the lack of armor and firepower hindered their active service in this area. 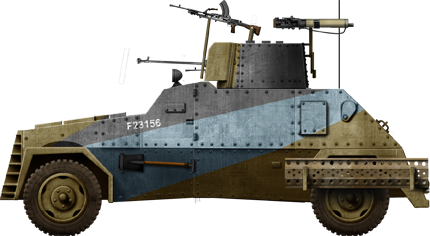 Once the Mk.II was available (in November 1940), the Mk.Is were relegated for training in South Africa. The Mark II was better armed and was the first true 4 wheel drive armored car in service in the Commonwealth. It was subsequently largely produced and used by British and Commonwealth forces (Anzac forces in North Africa) and performed well against Italian forces, at least until the end of 1941. But their weak armor proved an issue against the German Afrika Korps and they were gradually phased out when the Mk.III came as a replacement. They were sent to training units, less active sectors or side theaters like in East Africa, were nearly all South African Mk.IIs were already soldiering. The British/Commonwealth Mk.II in North Africa were often rearmed with various captured armaments, heavier usually. This led to the elimination of the turret, the operating crew being protected by the gun shield. Marmon-Herrington Mk.I, the first of this lineage assembled in South Africa. It was only used by South African forces, mostly in Eastern Africa during WW2. 133 (130 from other sources) were built from mid-1939 to November 1940. There are few photographs of these vehicles, only active with the UDF during the east African campaign of 1940-1941. Marmon-Herrington Mk.II of the British series (“Middle East” model) with maximal armament, comprising a Boys AT rifle, a coaxial Bren and two pintle mounts with a rear Vickers and a front extra Bren (which was rarely seen). Marmon-Herrington Mk.II captured by Axis forces, XXIst Panzerdivision, Tobruk, June 1942. Marmon-Herrington Mk.II with a captured German PaK 36, El Alamein, November 1942. Notice also the extra rear door, a Mk.III feature.